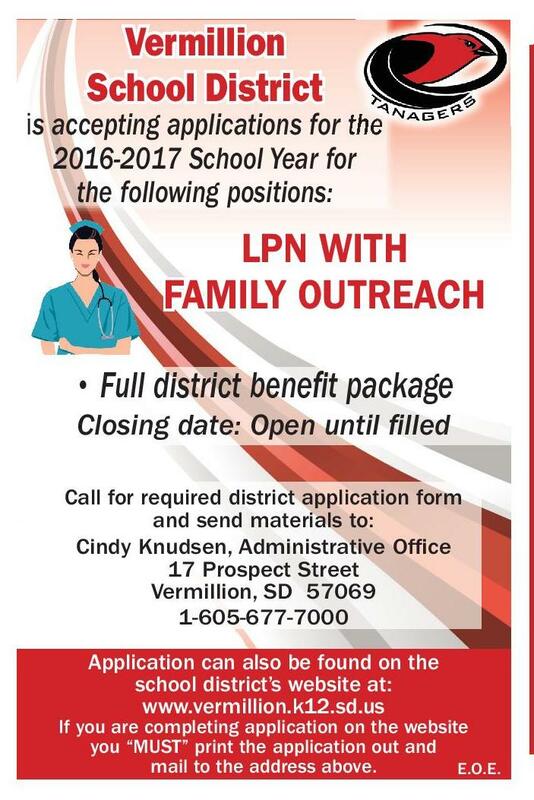 Broadcaster Press 7 July 12, 2016 www.broadcasteronline.com Vermillion School District is accepting applications for the s 2016-2017 School Year for the following positions: LPN WITH FAMILY OUTREACH • Full district benefit package Closing date: Open until filled Call for required district application form and send materials to: Cindy Knudsen, Administrative Office 17 Prospect Street Vermillion, SD 57069 1-605-677-7000 Application can also be found on the school district’s website at: www.vermillion.k12.sd.us If you are completing application on the website you “MUST” print the application out and mail to the address above. E.O.E. 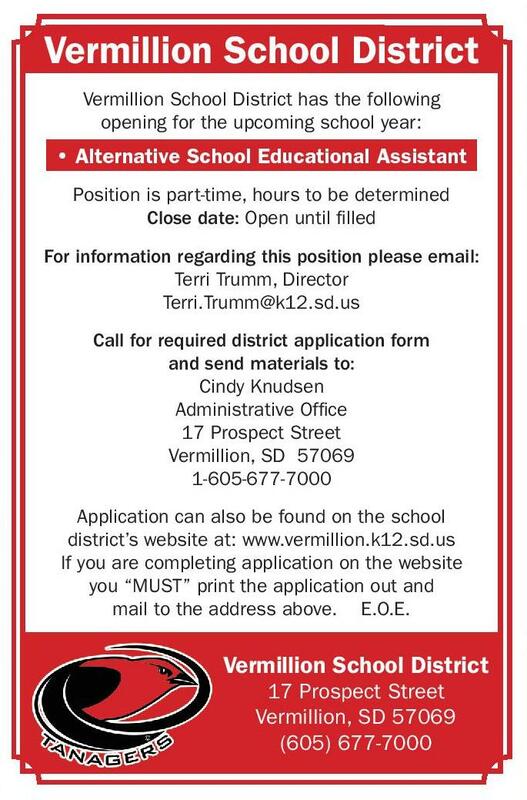 Vermillion School District Vermillion School District has the following opening for the upcoming school year: • Alternative School Educational Assistant Position is part-time, hours to be determined Close date: Open until filled For information regarding this position please email: Terri Trumm, Director Terri.Trumm@k12.sd.us Call for required district application form and send materials to: Cindy Knudsen Administrative Office 17 Prospect Street Vermillion, SD 57069 1-605-677-7000 Application can also be found on the school district’s website at: www.vermillion.k12.sd.us If you are completing application on the website you “MUST” print the application out and mail to the address above. E.O.E. Vermillion School District 17 Prospect Street Vermillion, SD 57069 (605) 677-7000 Vermillion School District Place an ad. Make money. 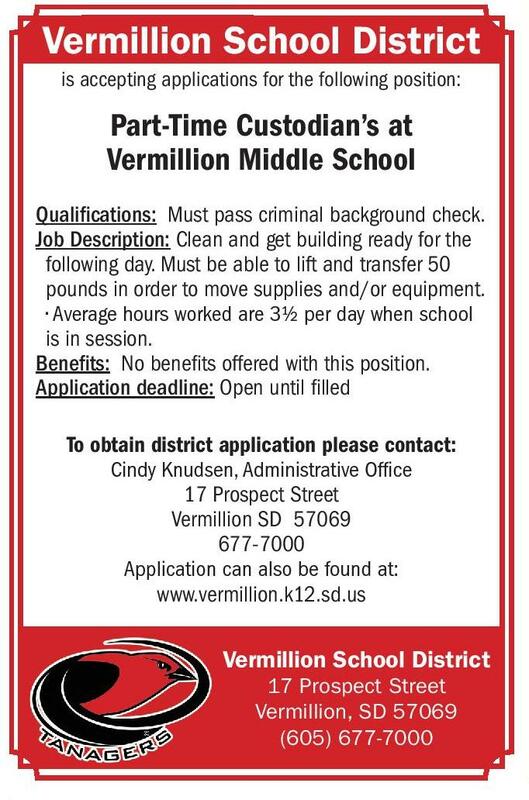 is accepting applications for the following position: Part-Time Custodian’s at Vermillion Middle School It works! Qualifications: Must pass criminal background check. Job Description: Clean and get building ready for the following day. Must be able to lift and transfer 50 pounds in order to move supplies and/or equipment. • Average hours worked are 3½ per day when school is in session. Benefits: No benefits offered with this position. Application deadline: Open until filled To obtain district application please contact: Cindy Knudsen, Administrative Office 17 Prospect Street Vermillion SD 57069 677-7000 Application can also be found at: www.vermillion.k12.sd.us Vermillion School District 17 Prospect Street Vermillion, SD 57069 (605) 677-7000 Call Today! 624-4429 For detailed descriptions and to apply, go to http://yourfuture.sdbor.edu EEO/AA Experience...the Difference! LENDING ASSISTANT/Backup Teller With total assets exceeding $1.3 billion and a financial team of over 350 dedicated banking professionals, FIRST DAKOTA NATIONAL BANK is seeking a Full Time Lending Assistant/Backup Teller for our Vermillion location. Rotation of hours include M-F 8:30 am - 5:30 pm, rotating Saturdays 9:00 am - 12:00 pm. Qualified candidate will possess strong interpersonal, communication and problem solving skills; will be professional and organized, and demonstrate a friendly customer service demeanor. Preferred candidate will have at least 1-3 years of business banking loan support experience, strong attention to detail, as well as familiarity with UCC’s general financial information, title work, real estate and commercial lending. The individual will possess cash handling experience, good manual dexterity, ability to maintain strict confidentiality, have strong numerical skills and follow bank policies and procedures. This position may also require standing for long periods of time and the ability to work accurately and efficiently under pressure. Proficient computer skills, including Word and Excel, are necessary. Rotation of hours include M-F 8:30AM - 5:30PM, rotating Saturdays 9:00AM - 12:00PM. FIRST DAKOTA offers competitive compensation and excellent benefits including Medical, Dental, Life, Short and Long Term Disability, Career Apparel & 401(k). Successful applicant must pass pre-employment screening including credit history and criminal background check. 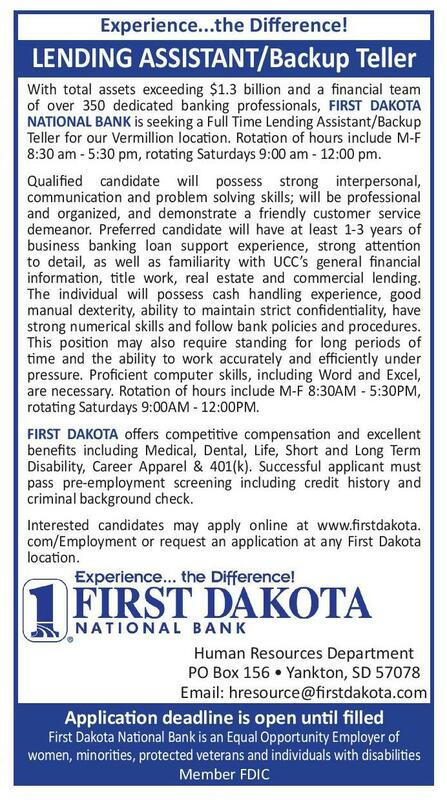 Interested candidates may apply online at www.firstdakota. 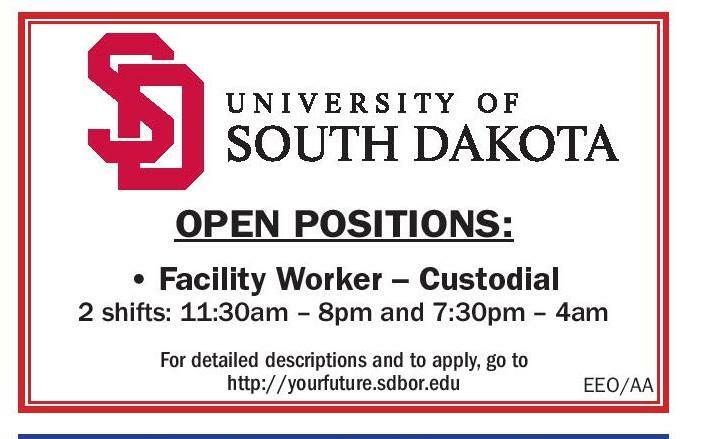 com/Employment or request an application at any First Dakota location. Human Resources Department PO Box 156 • Yankton, SD 57078 Email: hresource@firstdakota.com Application deadline is open until filled First Dakota National Bank is an Equal Opportunity Employer of women, minorities, protected veterans and individuals with disabilities Member FDIC Call Dewey or Gena 1 (800) 585-4441 Part-time – no benefits with this position Beginning first day of school and ending on the last day school is in session Closing date is: Open until filled 17 Prospect Street Vermillion, SD 57069 (605) 677-7000 • Facility Worker – Custodial 2 shifts: 11:30am – 8pm and 7:30pm – 4am Must possess a Class A CDL with Hazmat and Tanker Endorsements or willing to obtain. 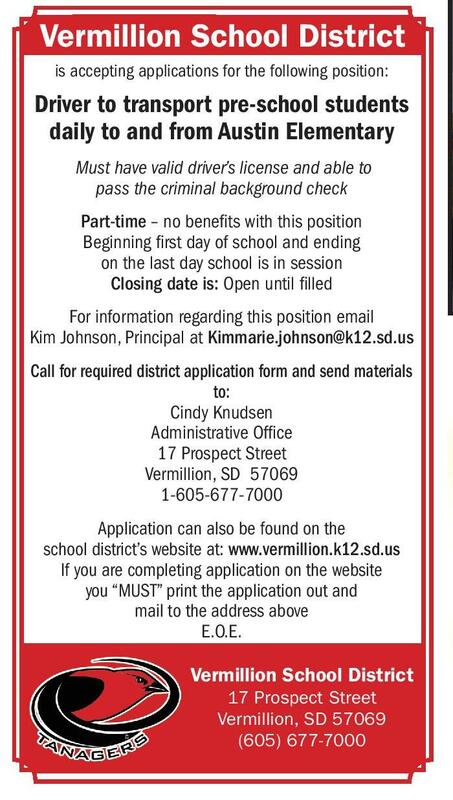 Must have valid driver’s license and able to pass the criminal background check Vermillion School District OPEN POSITIONS: Full or Part-Time Driver to transport pre-school students daily to and from Austin Elementary Application can also be found on the school district’s website at: www.vermillion.k12.sd.us If you are completing application on the website you “MUST” print the application out and mail to the address above E.O.E. CONTACT LANCE AT: 563-542-7662 • Excellent Wages • Paid vacation • Health Insurance Benefits • Good Equipment • 401K • Paid Training • Profit Sharing Potential is accepting applications for the following position: Call for required district application form and send materials to: Cindy Knudsen Administrative Office 17 Prospect Street Vermillion, SD 57069 1-605-677-7000 Terminal from your home. All miles driven pay. Load/Unload pay. Safety Bonus quarterly. Paid annual vacation and bonus. Health Savings, and AFLAC. 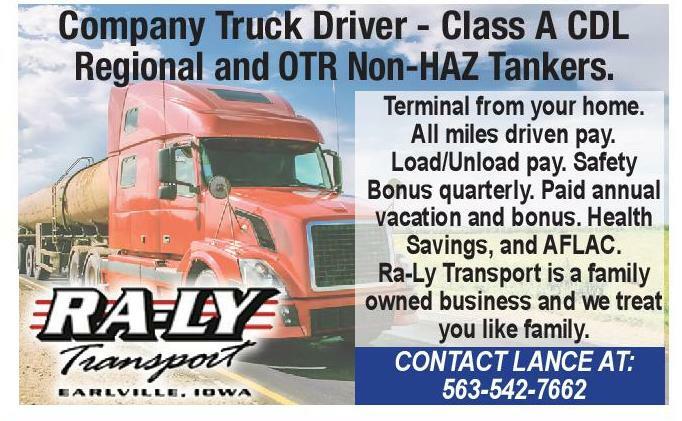 Ra-Ly Transport is a family owned business and we treat you like family. Petroleum Transport Drivers Needed Vermillion School District For information regarding this position email Kim Johnson, Principal at Kimmarie.johnson@k12.sd.us Company Truck Driver - Class A CDL Regional and OTR Non-HAZ Tankers. PER SPA NEW ERY ELIV D TES ROU Equal Employment Opportunity / Affirmative Action Employer Enjoy short early morning hours! Monday-Saturday. Earn $200-$400 per month $100.00* Sign On Bonus *$50 after 3 months of service, $50 after 6 months of service. 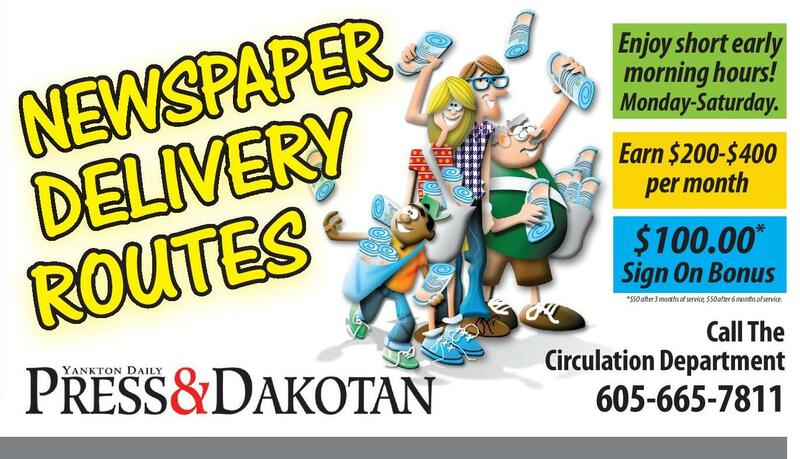 Call The Circulation Department 605-665-7811 If you don’t get the word out about your business, no one else will!! !